Start the quest by speaking to Trufitus located in a small house just north of Tai Bwo Wannai. 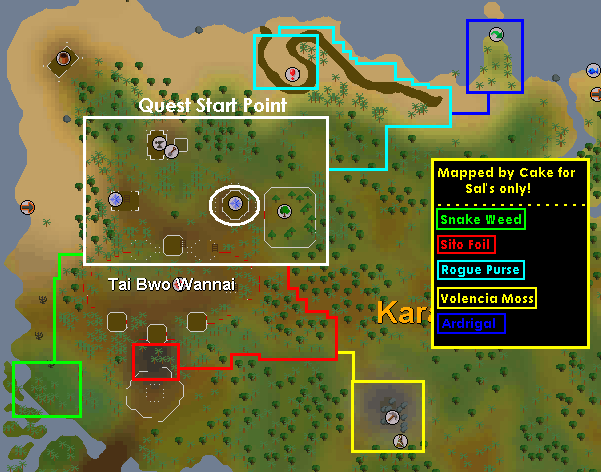 To begin the quest, first speak to Trufitus located in Karamja north of Tai Bwo Wannai. Ask him where everyone is, and he replies that everyone has left the village because they are afraid to stay in the village. Ask that you may help, and Trufitus summarizes that he needs several herbs to mix a potion so that he may commune with the gods. The first herb that Trufitus requires is called Snake Weed. He says that these herbs are found near water. Head west of Trufitus until you reach the ocean. Walk south and you will find a "marshy jungle vine." Search it and you will find an unidentified herb which appears to be a Snake Weed herb. Return to Trufitus and give him the herb to be given another clue. Trufitus speaks of another type of a herb, named Ardrigal. 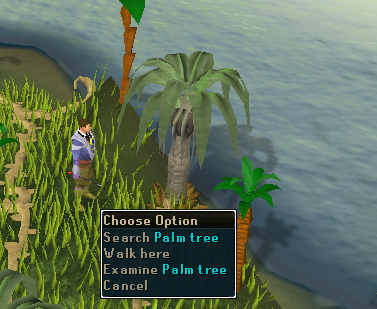 It can only be found growing on palm trees, so head north of the village until you reach a cliff. Head northeast and you will find some palm trees. Search them and you will find the herb which you will need to give to Trufitus. Sito Foil is another herb that Trufitus needs. He explains that these kinds of herbs are only grown in soil that has been recently burned; a campfire for example. 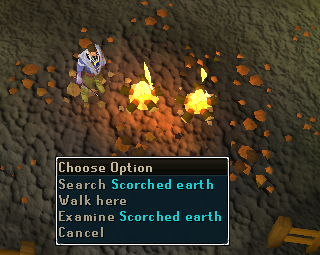 Walk south of the village and look on the "scorched earth" which you should search and you will find the herb. Return that to Trufitus and receive another clue. Another herb named Volencia Moss can be found growing in rocks. Walk southeast and you'll come upon a mining site. Search one of the empty rocks and you will find the herb that you should give to Trufitus. You'll be given a last clue to find the last herb. 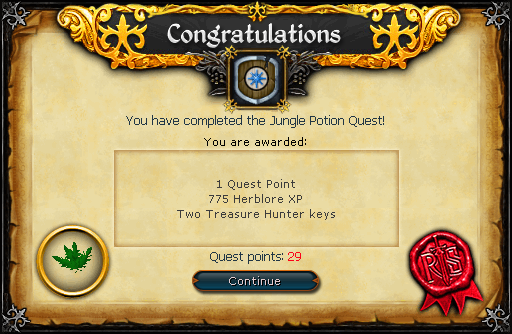 The last required herb is named Rogues Purse, and it is only found in caves in the rain forest. Head back to the northern cliff and follow it east until you find a path. This path will lead you to a cave entrance. Once you have gone inside, you'll find some Jogres. They are level 84, and are aggressive if you have a low combat level, so you will want to either set your run mode to "on" or carry some good armor. Run to the end of the passage and you will come to some fungus that you need to search to find the last herb. Return back to Trufitus and give him the herb. Once all of the herbs have been given to Trufitus, he'll grant you some Herblore experience. Quest complete! [^] Head south-south-west to find the Snake Weed by searching the roots. [^] Head back to Trufitus. [^] Head north-east until you see some palm trees. [^] Search them to find the Ardrigal. [^] Walk south to find the Sito Foil by searching the scorched earth. [^] Head southeast to the mining site. 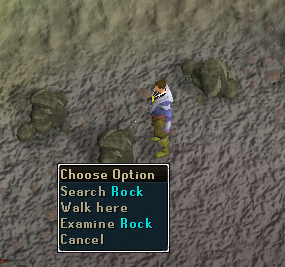 [^] Search the rocks for the Volencia Moss. [^] Walk north to a cliff to enter a cavern below. 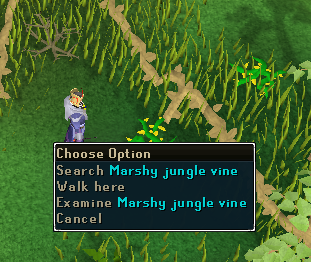 [^] Search the vines at the end of the cavern to find the Rogues Purse. [^] Head back to Trufitus to finish the quest.